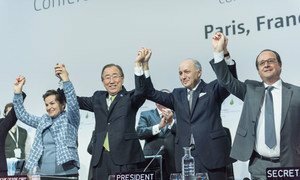 Secretary-General Ban Ki-moon (second left), UNFCCC's Christiana Figueres (left), French Foreign Minister Laurent Fabius and President of the UN Climate Change Conference in Paris (COP21), and President François Hollande of France (right), celebrate historic adoption of Paris Agreement. At a briefing at UN Headquarters in New York on the high-level signature ceremony for the Paris Agreement, which he will host on 22 April, Secretary-General Ban Ki-moon said the ceremony will provide the first opportunity for Governments to advance the process that will lead to the Agreement's implementation and ratification. Mr. Ban added that all leaders will have the opportunity to make a national statement on the day of the ceremony. As such, he asked that leaders come ready to provide an update on how their Government will implement national climate plans and integrate them into their overall sustainable development plans, as well as provide a roadmap for increasing ambition over time to achieve the overall aim of limiting global temperature rise to well below two degrees Celsius. He also asked leaders to be ready to indicate their Government's timetable for ratifying the Paris Agreement, and to share how they are accelerating climate action before 2020 by drawing on the ingenuity, resources and efforts of all sectors of society.